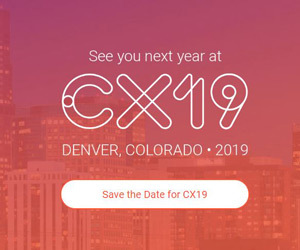 A mile up, at the edge of the Rocky Mountains, Denver, Colorado, will play host to CX19. And with CX19 hosted at the fabulous new Gaylord Hotel, the facilities should prove to be nothing less than world class. Sign up now for updates and make sure to add the dates to your calendar, because you won’t want to miss out on all the newest developments in CX. If you share your basic information, you’ll also get a valuable savings code for use when registration opens.